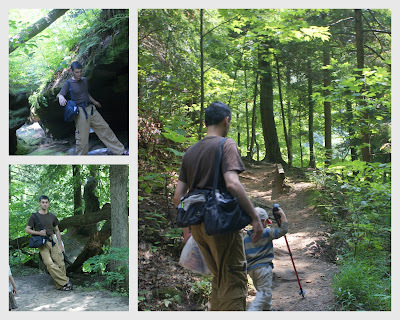 Way back on the 15th, we went hiking at Eagle Creek. We were sort of celebrating a big test that Daddy had finished the day before in Chicago. It was a long hike (over 4 hours including the river dip), but the kids were totally troopers. They actually seemed to get their second wind as the trail headed upwards and became more rugged. Caiden (3 1/2 weeks old at the time) loved riding along in his sling. And, of course, hanging out in tree stumps: We laughed at Kayla for resting on every rock she passed. But she actually really suprised us with her hiking legs. When the trail became very slippery and rugged in Falls canyon, we decided to start our return trip. She wanted to keep going. In this picture we were talking about the incredible shades of green created when the sun filters through the leaf canopy of the forest. It was reminding us of the color of the girls' room in Alabama. We loved that color. We needed signs reading "slow moving hikers...please pass to the right." We'd hear comments like, "you're brave!" as couples would hike past us. There are definitely two kinds of hiking for us: family hiking and couple hiking. We love to hit a long rugged trail and keep it moving pretty steady to our destination. 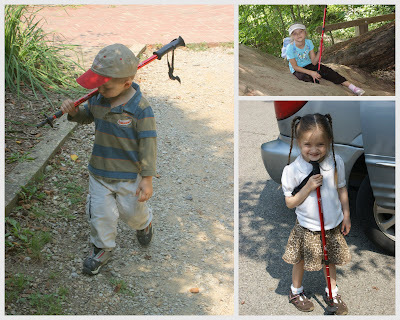 But we read early on (and validated through experience) that when hiking with kids you CANNOT be destination-minded. David (male as he is) has done a realy awesome job of keeping the two kinds of hiking separated. He doesn't push the kids. We stop when we need to. We observe and and sing and smell and sit and eat in caves and slide on rocks and take the time we need. Caiden checks out the trail map> Isn't that trail gorgeous? David and the kids took a long dip in the river on the way back down the trail. Corin and I hung out on the rocky river bank. David and I are anxious to go back with just us and the dogs sometime and hike the ladders trail. We left exhausted.... but it was the happy kind of exhausted. Girl! You were out hiking at 3.5 weeks postpartum! Wow! Exclamation mark, exclamation mark, exclamation mark!!!!! !